Maybe its because I used to live in New York or Northern California but I am always ready to pack up my shorts and swimsuits and pull out the bin full of sweatersm sparkly shirts and boots. I love the holidays starting with the weeks leading up to Thanksgving all the way through to New Years Day. This LOVE of the Season often gets me in a bind and I have feelings of panic, rapid breathing and spiraling thoughts that keep me up at night. For example, “How am I going to manage multiple holiday parties each week week AND keep on track with not only my wellness goals but the childres events too? Or gee, did I remember all those people on my list, the christmas cards, teacher gifts and how do I thank all of the people who help care for me each year without going broke! Or my personal favorite, I’ll get on that in Januaury?” These lists in my mind can be endless. Anyone else know what I’m talking about? The good news is last year I spent a lot of time being mindful and reflecting on those things that really did help to keep me on track with my own personal goals during that time. Moments where I could have let something go and enjoyed the moment just a little bit more, yet also I reflected on those moments where I definitely let something go and wished I would have moderated my choices just a wee bit more. In last years experienment I had a couple of priorities, keep family first, joy front and center and keep my nutrition and exercise simple and attainable all season long. As a lifestyle coach, I know how important it is to not only take care of our physical health but also our mental health, SPECIFICALLY during the holidays. November-January. I’m always talking about how I have recognized that I can’t do EVERYTHING myself. I need a little help from my friends. 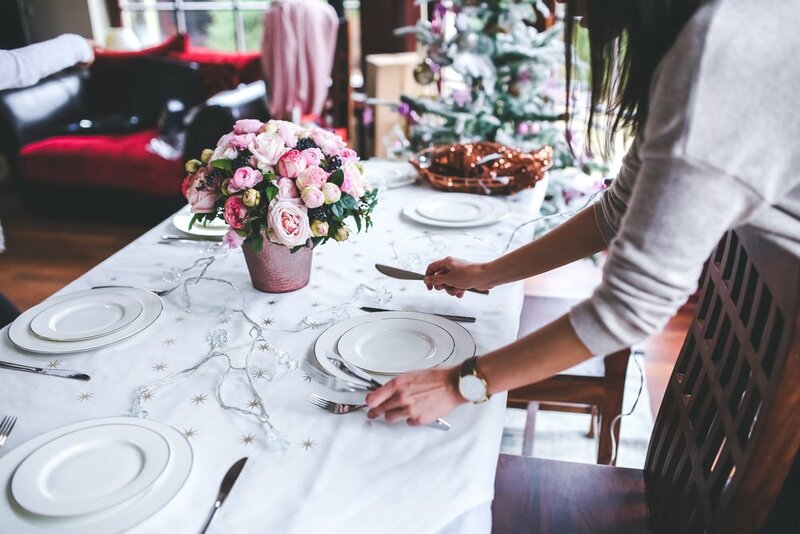 From one friend to another, here are my personal tips and tricks for staying on track this holiday season through a little mindful moderation and balance. 1. Schedule EVERYTHING- Literally. I talked about this on my Insta account. Get our your planner out right now. Write down Every. Single. Thing. EVERY event, holiday party, dinner with family, cocktails with work, hangouts your friends, date night. Don’t forget the gift list too! Lliterally, write every little thing down so you can see it all in one place. Then make sure you really want to do all of it and if you can trim some events for mental health, say NO. 2. Accountability- Find a friend or spouse that wants to also stay sane this holiday season and help each other out. They can help you stay on track and keep you accountable especially if you know you’re the type of person who needs a little outside help and reinforcement. Not only can they do that but you’ll have someone to go when your feeling overwhelmed and need a pep talk. 4. Goals- Get crystal clear on what your goals are for this present moment (not January). Fitness, nutrition, mental, emotional, you name it. The more specific, the more likely YOU are of sticking with them. Now, the next part may be awesomely empowering or excruciatingly painful, but this is where the real magic and moderation happens. Cross things off your list, start NOW. Grab that list I just told you to write. Which events feel good? Which ones will bring you joy? Also, keep in mind the people attending the actual events, as well. Now, looking at your list, did any make the cut that seem obligatory? C’mon, we all have that one holiday work event with co-workers we can’t stand. Or if you really can’t skip anything, mindfully and specifically choose those events that you truly want to savor the moment in and possibly indulge in an extra cocktail or two. Those where you want that piece of choclate brownie or a piece of grandma's pumpkin pie that won’t make you feel guilty. Be specific and choose those moments, those events with special people that you truly want to cherish and indulge in. That’s what we remember long after the holidays have past. Those moments that fill us with joy, that make our heart soar and that provide memories that last a lifetime. 5. Ok, so now that you’ve gotten clear on those events that you want to let yourself live a little at, go over each one and see where your goals will fit into the scenario and where they may need to shift a little. Sometimes that huge bowl of pasta and Dad’s meatballs that you’ve been craving for months is just oh so worth it and other times, that 5th glass of champagne may not be ideal in the long run. Or, i.e., maybe one party you KNOW you need to drink at (great DJ maybe or maybe its at a family members your not so fond of), maybe you select another event where you sip on a sparkling water instead? Remember, it’s okay to let your plan veer if it is hindering your happiness. Don’t let perfect be the enemy of the good. We all want to live our best lives, especially around this time of year with family and friends. It’s just much more empowering when we choose those moments.